The Del Mar College recreational facilities include a 25 meter indoor pool, 4 racquetball courts, 6 tennis courts, jogging track, weight room and gymnasium. All facilities are available to currently enrolled Del Mar College students and full-time employees for recreation during specified hours on weekdays and weekends. A valid DMC I.D. card is required and family registration cards are available. Recreation hours are based upon class schedules and change each semester. These published hours are subject to change for special events and intramurals. Signs will be placed on the front doors to buildings when changes are to be made. Faculty, staff, and students must present a valid Del Mar College I.D. card. Register at the recreation desk before entering all areas. Facilities will not be open on official college holidays. Dressing rooms will not be available on Friday after 1:00. Equipment checked out must be in by 5:00 pm Monday-Thursday and by 12:00 on Friday. Cards may be completed at the registration desk in the Foyer of the Aquatic Center (Monday thru Thursday from 2:30 - 4:00pm) or in Gym 104. Only spouse and children (under 21 years of age) living at home may be registered. Valid ID card must be presented when a family registration card is requested. CARD MUST BE COMPLETED IN FULL WITH SIGNATURE AND DATE/YEAR. The 25 meter pool has 3 and 10 meter diving boards. Please follow the swimming regulations when using the pool. All students and DMC employees will be required to show their current Del Mar College ID card and must sign in to use facilities. All students and adjunct instructors must have a current semester stamp on card. Identification cards may be obtained at the East Campus Library. Contact Library, for specific hours of operation. Appropriate swimming attire must be worn. No cut-offs or shorts will be allowed. No jewelry, hair pins, gum or hard candy allowed in the pool. Please bring shampoo, crème rinse, deodorant, etc in plastic containers. No scuba tanks or regulators are allowed in the pool, except during approved instructional class. Only one person will be allowed on the diving board at a time. Only one bounce or spring per approach will be allowed. No diving from the deck of the pool, in less than 9 feet of water. All persons shall walk carefully around the pool area as it can be slippery. All individuals must have the ability to enter and exit chairlift and/or pool on their own accord. Children below 12 years of age must be supervised by an adult 18 years or older (valid picture ID required for proof of adult’s age). High diving board is off limits. NO EXCEPTIONS. Non-potty trained children must have disposable diaper or diaper with water proof pants. Due to safety guidelines, no exceptions will be made. Participants who cannot swim and require a personal flotation device for support must have an adult (16 years of age or older) in the water with them at all times. No smoking, eating or drinking in facilities. No smoking in patio area. Participants may drink in foyer area, however, eating/smoking must be done outdoors. Dispose of all trash by using trash receptacles. Water bottles (non-glass) are allowed in all areas. 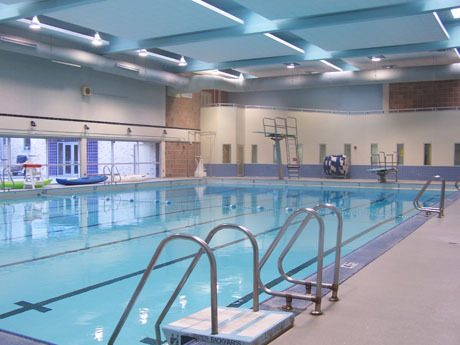 Pool divider rope must be in place during recreational swim and during all water exercise classes. Equipment is for instructional use. Check with lifeguard, prior to usage, for permission to use specific equipment. To insure safety, additional rules may be enforced, as needed. For a detailed list of rules for each facility, visit our website or review rules posted in various areas of Aquatic Center, Gymnasium or Kinesiology Complex. Please refer to “General Regulations” for additional information. The Shelby Torrance tennis courts are located between the Fitness Complex and the Lichtenstein Center for Early Learning. There are 6 courts and a practice wall. The weight room is now located in the new Fitness Center on the first floor. All weights must be returned to racks after use. If Fitness Center is left in disarray, it will be closed for recreational use. To avoid injury, use proper techniques for all lifting programs. If you need assistance, contact the supervisor or Fitness Center attendant. Use spotters for heavy lifting. No participant under 16 years of age, other than currently enrolled Collegiate High School students, may access Fitness Center. Collegiate students must present validated DMC ID card. Collegiate guests must provide valid proof indicating they are 16 years of age or older. Items such as backpacks, purses, totes, etc are not allowed in Fitness Center, except during class time and with approval of instructor. Participants should be aware of their personal limits. It is the responsibility of each participant to seek doctor’s advice, prior to using any weight or workout equipment. Fitness Center attendant is a part-time and/or student worker. The attendant is not a medical doctor nor a trained professional. Attendant may show you proper use of machine but does not have the ability to recommend or determine what your personal capabilities/limitations may be. No smoking, eating or drinking in facilities. No smoking in patio area. Participants may drink in foyer area, however, eating/smoking must be done outdoors. Dispose of all trash by using trash receptacles. Water bottles (non-glass)are allowed in all areas. All participants must have a clean towel to wipe down equipment, after usage. If you do not have a towel, you may check one out from Gymnasium 115 with a validated DMC ID card. Only non-marking athletic-type shoes are allowed. No open-toed, flip-flops, sandals, high heels, wedge-type, loafers, etc may be worn. All shoe laces must be tied, no loose hanging laces. No exceptions. For a detailed list of rules for each facility, visit our website or review rules posted in various areas of Aquatic Center, Gymnasium or Kinesiology Complex. Please refer to “General Regulations” for additional information. 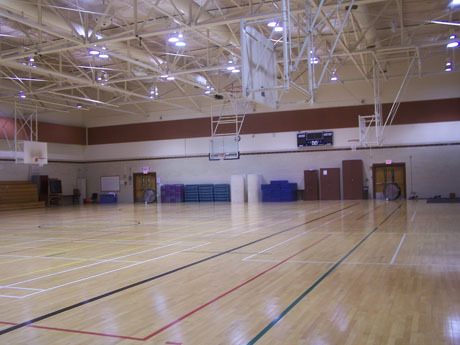 The gymnasium has markings for a regulation basketball court, 2 regulation volleyball courts, tennis court, and several badminton and pickleball courts. All students and DMC employees will be required to show their current Del Mar College ID card and must sign in to use facilities. All students and adjunct instructors must have a current semester stamp on card. Identification cards may be obtained at the East Campus Library. Contact Library for specific hours of operation. Participants must be properly attired for participation: shirt, shorts or wind/warm up pants and non-marking athletic shoes. During basketball and/or volleyball participation, no jewelry will be permitted. Included but not limited to: piercings, earrings, rings, watches, necklaces, and/or chains. The gymnasium facility will accommodate basketball, volleyball, badminton, pickleball, table tennis, etc. No sport will dominate the court space. Only one court will be used for basketball. Depending on the demand for sports participation, the supervisor may allow both courts to be used for basketball. All basketball games will be played on cross-courts. Full-court games will not be allowed. Participation in sports activities is of a recreational nature with no officials provided for any of the activities. Disagreements or arguments among participants are cause for immediate termination of the game and possible suspension of participants. Participants may check out equipment from Gymnasium 115. A current DMC ID card is required. Participant is responsible for proper care of equipment. Participants acting in a disrespectful manner will be suspended indefinitely (see General Regulations regarding suspension). Foul language is cause for immediate removal from facility. Gymnastics equipment, mats and exercise balls are for academic use only. Volleyball/Badminton poles and nets are for academic and intramural use only. Other uses must be approved by DMC Kinesiology staff member. Children below 12 years of age must be supervised by an adult 18 years or older (valid picture ID required for proof of adult’s age). Basketball, Volleyball and Racquetball participants may not play while small children are in their care. No exceptions. 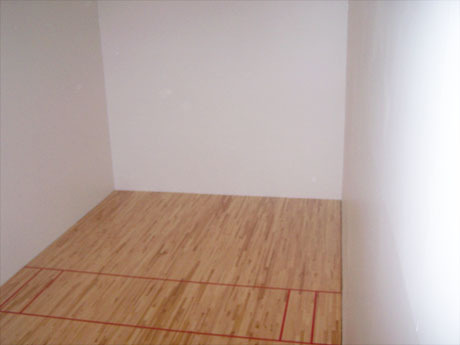 Four racquetball courts are accessible from the upstairs balcony or from the walkway on the first floor of the aquatic center. Reservations may be made from 1:00-4:00, Monday-Thursday, prior to the day of participation. Reservations may be made in person in Gymnasium 115 or by calling 698-1947. Reservations for Saturday, Sunday and Monday may be made on Thursday from 1:00-4:00pm or Friday, between 8:00-10:00am. Unreserved courts may be used by signing the reservation sheet posted in court mezzanine area. Reservations are in one hour increments. At the end of an hour, if no one is waiting to play, participants may continue play but may not monopolize courts. After 10 minutes, late arrivals relinquish their court reservation. ALL PLAYERS MUST WEAR EYE GUARDS. Eye guards may be checked out from equipment room (Gymnasium 115). Prescription eyeglasses are an acceptable replacement for eye guards. If a student refuses to wear eye guards, they will be asked to leave the facility. Participants will be removed from the facility, for destructive abuse of court (walls, floors, doors, bulletin boards, whiteboard) or littering in facility areas. Participants acting in a disrespectful manner will be suspended indefinitely. (See General Regulations, regarding suspension). A new track is was constructed in the grassy area along Baldwin. The outdoor track is 1/8 of a mile. The track may be used from 7:00am until dark when not in use by a scheduled class. Open when not in use by an academic class. All equipment must be turned in prior to 5:00pm.